Babylock Intrepid – Demo Sale! Embroider on a massive 7-7/8″ x 11-3/4″ space, giving you more room than ever before! 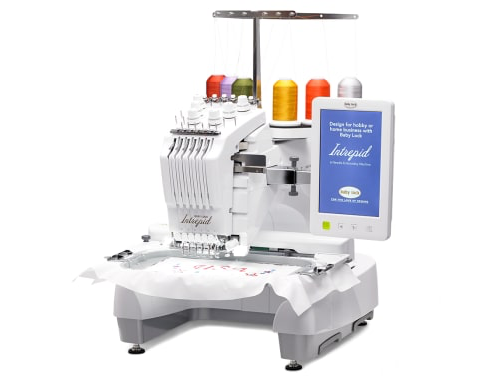 This high-definition TruView IPS LCD touchscreen brings your embroidery designs to life. It displays over 16 million colors so every image is vivid and bold. Plus, large touchscreen buttons help with quickly editing designs and accessing machine settings. Choose from 86 built-in embroidery designs with 60 exclusive designs. You’ll find inspiration for any embroidery project ready to go at the touch of a button. With six needles, you’ll love how quickly you can embroider large, multi-colored designs. And if you’re running an embroidery business, you can finish projects without excessive thread changes between jobs. With onscreen editing at your fingertips, you can make quick changes to designs and start embroidering right away. Drag and drop designs on the LCD screen and make instant changes. Combine, reposition, rotate, and mirror designs to customize every project. The Intrepid comes with a variety of built-in fonts to help make every project unique. The 37 built-in fonts include a large floral alphabet and Greek letters. Now you can give every project a distinct look. Embrace larger, multi-colored designs and watch them stitch in no time! The Intrepid works at up to 1,000 stitches per minute. Use USB connectivity to quickly import your very own designs to your machine from a computer or flash drive. This entry was posted in Sewing Machines and Sergers and tagged Demo Serger Sale, Serger Sale by admin. Bookmark the permalink.